Watching this, I realized there's a relevance here to my life as a computer programmer: judo is inherently a "pairing" activity. You work with a partner for all the most important stuff. As my Sensei says: "Good for me, good for you." It's important to learn how to be a good judo partner, which includes adjusting for the different types of people you partner with: different skill levels, different goals, different sizes, shapes, and so on. In a drill like the one these girls are doing, both parties should participate mindfully — not just the person practicing the technique (tori) but the person it's being practiced on (uke). Anybody can be a good uke. If you are less advanced than tori, you can still do the basics correctly like not being too stiff or too limp, adjusting your movements per their requests, and knowing how to do a proper breakfall if needed. Meanwhile, you can pay attention to what tori is doing and learn what it is they are practicing to accomplish, how they are trying to disrupt your balance. It is valuable to learn this from uke's perspective, to engage mentally and not be a passive practice dummy. You shouldn't think too hard — "think" is probably the wrong word anyway — you just have to stay aware and open and you'll learn a lot by osmosis. At least that's my theory. Think of that quote about Ginger Rogers: she did everything Fred Astaire did, except backwards and in high heels. When you are a mindful uke you are sort of practicing judo backwards and in high heels. If you are more advanced than tori, and understand what they are practicing well enough, you might provide verbal reminders and cues — "Pull the sleeve," "Don't bend over," "Hips need to be lower," and so on. Sometimes, though, silence is better and it's more important to let tori keep trying what they're trying. You can also adjust your own movements to help tori with the intricacies of the technique they're practicing. For example, if tori is working on the timing of a foot sweep it's uke's job to move naturally while knowingly being vulnerable. It takes practice to do this, because you must pretend, over and over, that you have zero anticipation that your balance is about to be disrupted. Any anticipation will come through as tension in your body that tori will be able to sense, and this will be counterproductive. To use another movie analogy, think of that blooper in North by Northwest when a kid covers his ears because he knows there's about to be a loud bang. Being able to relax that anticipation can be tricky; it's hard not to be that kid. The feeling of being tripped is quite unsettling, and here you are helping tori get better at doing that to you. Back when I was playing judo I think I was pretty decent at "pairing" in terms of adjusting to the person, being aware of safety for both parties, and so on. As a programmer I think my "pairing" abilities could use improvement, which will only happen if I practice as diligently as these two little girls. Some friends were wondering whether Rafaela Silva's winning throw in the gold medal match might reasonably have been ruled hansoku-make (disqualification), since she seemed to grab the leg of her opponent, Dorjsuren Sumiya from Mongolia. It's a little hard to tell watching at full speed, but I went through it frame by frame and I'd say it was definitely not hansoku-make. If anything I wonder if it should have been ippon (full point, end of match). Although it may not be immediately obvious, Silva was countering, not attacking, which I believe is an exception to the rule against leg grabs. I'm pretty sure that alone is enough to settle the matter. Even if that weren't the case, page 23 of this IJF document says that "it is possible to touch the leg of Uke if Tori has both hands in a real Kumi-Kata." The video shows that Silva was indeed gripping with a "real Kumi-Kata" throughout her counter-attack. Here's my analysis, in four screenshots. Screenshot 1. It's Dorjsuren (in the white uniform) who initiates the action by going in for hiza-guruma, which begins by planting one foot between the opponent's feet. Screenshot 2. To continue hiza-guruma, you block the opponent's shin with the flat of your other foot, and you rotate them like a steering wheel, with that foot at the center of the wheel. At least, that's the ideal. The problem is that the opponent's body must already have a little momentum in the direction you are trying to rotate them, or the throw doesn't work, or at least is much more difficult. You can see that although Silva is bent at the waist, her center of gravity is stable and well supported by her legs. Dorjsuren doesn't have the kuzushi she needs. By doing the steering wheel motion, Dorjsuren has brought Silva's armpit toward her own knee. What happens next is that Silva continues the motion Dorjsuren started and traps Dorjsuren's leg with her right elbow. 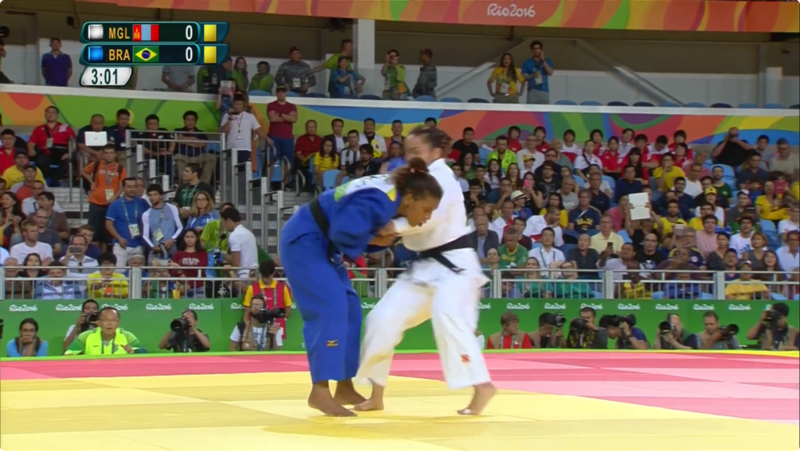 At the same time, Silva pushes with her left arm. She takes control of the rotation that Dorjsuren started and uses it against her. Screenshot 3. Silva's counter-throw is well beyond the point of no return. You can see that her right hand has been holding onto Dorjsuren's sleeve for the duration of the throw. Both her hands are in a "real Kumi-Kata". You can also see that Dorjsuren's body is a good foot off the ground, traveling at full speed. Side note: Dorjsuren has moved her left foot from Silva's shin to her inner thigh, presumably hoping for a counter-counter into sumi-gaeshi. It doesn't work; again, momentum and position are not on Dorjsuren's side, and Silva uses her body weight to squash the attempted counter-counter. Screenshot 4. You can see Dorjsuren lands about as flat on her back as you can get. That's why I think maybe it should have been an ippon. Well, okay, Neil Adams said it was waza-ari, but what does he know? I have been learning judo for a few years now. Not very aggressively either. About 2 classes a week when I can make it. A year off here. Half a year off there. I made it to the first brown belt and my rank is sankyu. Here is my layman's understanding of what judo has done for me so far. When I came to my first class I told sensei Oishi that I was not sure why I was there, I had no endurance, and my soles were very sensitive and even a walk on a sandy beach caused blisters. Sensei Oishi told me that endurance will come with time but as far as my soft soles were concerned, “Don’t worry, we’ll take care of that”, he said and smiled. That smile, his continued humour and easy going demeanor is what kept me in the dojo and made me want to learn more. 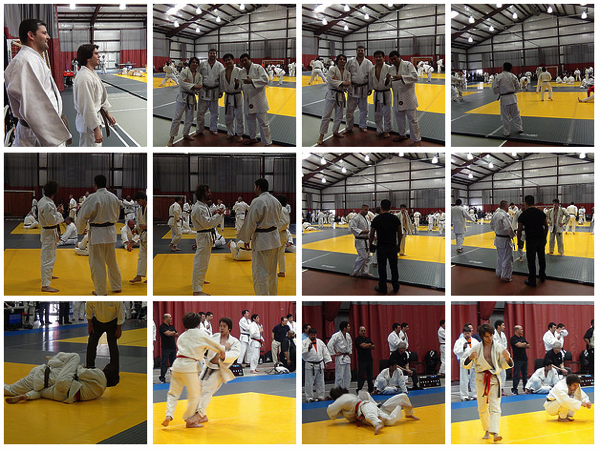 Before I continue about my current judo here is a little bit about my background. I did do some judo back in the USSR when I was about 6 years old. Only for a few months. That country allowed you to do any sport for free as long as you were olympic material. I was not olympic material for a number of sports that I tried. Judo, water polo, gymnastics, and a few others… Was expelled from all of them due to lack of balance or grace or perseverance, or the party line understanding. I lingered and managed to get ahead in karting racing. But that seemed to be a non starter when I got to the US. So here I found acrobatics and skydiving. Acrobatics lasted until I figured out how to link a back handspring into a back tuck. Skydiving hasn’t really left its hold of me, but that is a weekend thing. I did need to apply myself to something else and for a few years I was at loss to what. I tried Greco-Roman wrestling, but a young, and as it turned out overzealous, instructor assistant broke my ribs in the intro class so that did not work out too well. I ended up with difficulty breathing and spent 5 months healing. Then I met Sensei Oishi. Somehow this gentleman managed to take away my fear of the unknown, performance anxiety, and softened the lack of confidence. He took away everything that was blocking the will to learn. There was just acceptance and nurture. Sensei Oishi created such a non-threatening environment in a martial art class that a guy with blistering soles and confidence issues had no chance but to try and stick around long enough to figure out what is what. Sensei accepted every path to learn and nurtured it until it became self sufficient. I must admit, if it was not for this one specific individual I may have felt too threatened to even start the learning. He took all of the oppression out and created a fun and accepting atmosphere instead. At this point I am surrounded by extremely interesting individuals from his dojo who have so much to share I can’t keep up with them and the knowledge they are offering. Every class is like a drink of water for someone who is very thirsty. And speaking of thirst. I have always been a bigot about my vices. I had my scotch neat. I had my wine grapes unmixed. And yes, I liked my highs undiluted and pure. And then came judo. As I have learned, after a class of judo I can drink such things as PBR and other light beers. But what did judo actually give me other than acceptance of bad beers? It gave me a will. A will to push through obstacles. A will to try new things with unknown results. A will not to give up. 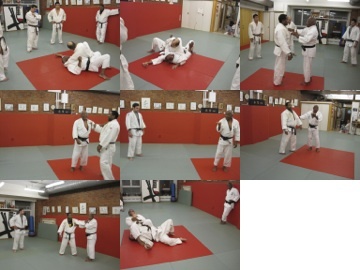 Judo is a marvelous philosophy that teaches through empirical experience. It teaches to experiment and try and keep going. It also teaches to let things go. If you are pushed into a corner, let it go and see where the things end up. I do not know if judo is unique in its way. But it opened my eyes to a number of ways of facing challenges. It has formed my current outlook on things. 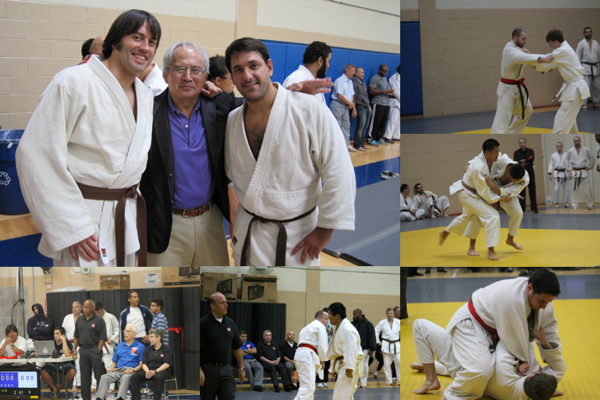 And being a rabbi by education, software engineer by day, adrenalin junkie through and through, I have one thing to say: the philosophy of judo is pure and flexible and does open one up to continuing learning. I am glad that my friends and my life circumstance brought me to this point where I can appreciate it and make this type of learning possible. Oh, and as far as my endurance, it went from 15 minutes to 2 hours. So Sensei was right, it was just a matter of time. And my confidence. It was not small to begin with, but now it has something to plant its roots in. I would definitely classify judo as a life altering and affirming experience. Judo changed my life. What changed yours? I'm not clear on why false ashiwaza warrants a shido. Do people use false ashiwaza to try to ward off a non-combativity penalty? If so, why not just ignore it as if it was a non-attack? Then, when however many seconds go by, award a shido for non-combativity? What's the difference between a false ashiwaza and a feint to try to get a reaction? Compare this to a false tomoenage. A false tomoenage can be used by a player who does not want to engage in tachiwaza to drag the opponent into newaza. Whether or not one agrees that's a reasonable thing to penalize, it's clear that a false tomoenage does have that effect. What is accomplished by false ashiwaza? Dave and Anne Williams were at the Thursday night class on October 10. 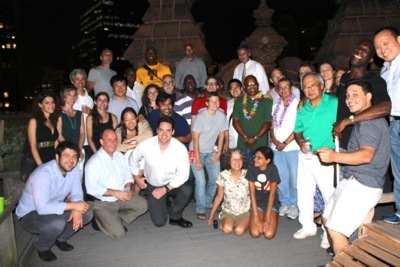 Click below for the full-size photos. I like these because I'm not sure I've ever seen Dave, Andy, and Jeff on the mat at the same time. The Hudson Promotionals were last Saturday. For this tournament they adopted the new IJF rules for refereeing. There was one referee on the mat and no corner refs. They installed two cameras in the corners and there were at least two (maybe more) judges sitting in front of video screens who reviewed close calls. The above link opens a web page that will load up with hundreds of thumbnails. I recommend giving them a while to load completely, and then you can scroll through them very smoothly. If that overwhelms your browser, try this link, which displays the same photos but is much easier on your browser. There's a new Flickr photo set with 486 photos from the promotionals on May 4. Click any of the thumbnails below to see the whole photo set. And here are videos, one for each division. Each video contains all the matches in that division, except for the masters video, which contains most of the masters matches. This year Miranda Carey, Ian Scribner and Gary Naccarato will represent the United States in the "Ravenna Judo Tournament 2013 – XI Edition" (judo tournament for disabled athletes) that will take place from Thursday 9th May 2013 to Sunday 12th May 2013 at Pala De Andrè Sport Place — Ravenna, Itally. Miranda and Ian have both competed in this tournament in 2007 and again in 2008. All three athletes are students at Ulster Budokai, 59 O'Neil St. in Kingston, NY. This is an international level Judo Competition for Special Needs Athletes, drawing as many as 200 competitors from all over the globe. Athletes are pooled by gender, size, and level of ability to create fair and exciting competition. While the Tournament itself is free, the travel and accommodation expenses are not. We rely on private donations to help give these athletes the ability to engage in true competition, which is not yet available in the U.S. If you would like to help with our expenses we would be most grateful. Any donations to help these athletes may be sent to: W.A. Scribner, 58 Jones Quarry Rd., Woodstock, NY 12498. Donations may also be made payable to the Travis Nissen Memorial Fund and can be mailed to PO Box 3537 Kingston NY — Please put Judo in the Memo. Please include your contact information so we can reply with a "Thank You", and let you know how well we do. Any questions about the athletes, the tournament, or Special Needs Judo can be sent to Bill Scribner at wascribner@gmail.com. I love these Gracie Breakdowns probably as much as chess fans loved Shelby Lyman breaking down Fischer-Spassky 40 years ago. Replay the moves, consider variations, figure out what made the difference between winning and losing. You don't have to be a grandmaster to appreciate what's being explained. Even a patzer like me gets to enjoy. I have greater respect for Carmouche's skills and instincts in this fight than for Rousey's previous opponents.